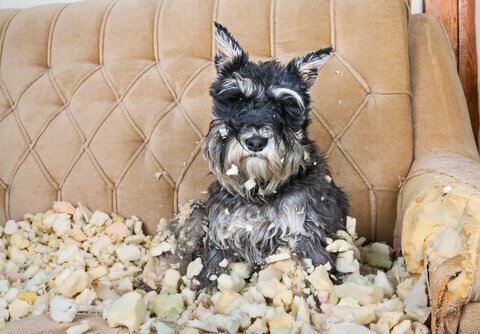 Taming the Teen – Surviving Your Dog's Adolescence! Adolescence starts at sexual maturity in dogs just like it does in humans. Your 5 to 6 month old puppy is like a 12 to 14 year old child, beginning to have a sense of self and independence. He has opinions. He complains about the rules and sometimes talks back. By 7 to 9 months he is a lot like a 16 year old (if you have a teenager you know what I mean!) Your young, social, and easy going puppy can change into a reactive, destructive, distracted adolescent. So what are some typical teenage dog behaviors? He used to never stray far from you – now he runs down the street. The “invisible umbilical cord” that used to cause your young puppy to want to be with you all time goes away at about 5 months, and so does his total reliance on you for security. You’ll notice a sudden upsurge in his desire for exploration. Those sharp little puppy teeth are gone but he’s breaking in a new set of spectacular adult teeth. Welcome to teething phase number two! During this time, your dog may find his teeth sore, and will do anything that he can to help ease that discomfort. In addition, He’s easily frustrated and easily bored. The stress over wanting to do SOMETHING can cause him to destroy whatever inanimate object is near. He needs confinement, supervision and a variety of appropriate things on which to satisfy his need to chew. He grabs things, shows them to you and then RUNS with them! He chooses things that he knows are guaranteed to get you out of your chair. He does it to get attention. Good or bad, it’s still attention. Chase and be chased, that’s the best dog game ever. He’s satisfying his need for attention and exercise. He’s also experimenting with how he can control his world. He needs a job to do and he needs to learn a way to earn attention the RIGHT way. Bossy bossy bossy. I need, I want, give me, let me … He has little or no impulse control and the world revolves around him. Your dog needs structure, clear black and white house rules. Learning to “sit to say please” will give him a clear understanding and expectation that he must do something you want in order to get what he wants. Neutering will also have a big effect on this issue. How do you survive your dog’s adolescence? He needs to use his brain for good, not evil! Bright dogs are going to problem solve all over the place, better it be YOUR agenda, than his! Positive training works the brain, burns energy, and builds a strong relationship. A leisurely walk around the block won’t do it nor will being left alone in a big yard all day with “room to run”. He needs to get his heart rate up. Teenage dogs need to play and play hard. Fetch, hide and go seek, doggy playmates, Dog Daycare. Physically satisfied, tired dogs are well behaved dogs! He may look like an adult, but he still has the brain of a puppy. Don’t be in a hurry to give him adult dog freedoms in the house. Continue to confine him when you can’t supervise. Crates, baby gates and tethers can keep your teenage dog out of trouble and keep him from learning that he can now reach the sandwich sitting on the coffee table. Most of all hold on to your sense of humor; this too shall pass!